"The Unknown Woman of the Seine"
was an unidentified young woman whose death mask became popular in the early 20th century. This story of the Unknown Woman of the Seine was first related to me by a good artist friend, Mario Gross. He had this copy of the mask hanging up at his home and I suppose, he picked it up in Europe during one of his many visits. Mario's walls were covered with art work and there were sculptures and curios on every surface, but it was the mask that fascinated me. Mario passed away not long ago and the mask came to me (believe it or not - no one else seemed to want it). I'm intrigued by it. L’Inconnue lives in my small room I use as a studio and I think of Mario and Paris each time I see her. This may seem morbid to many (I thought so too at first), but now, somehow, I don't see her that way. She's a part of history, her tale possibly fiction, possibly not, but she's definitely a part of the artistic side of Paris. At the end of the 19th century the Paris morgue was located behind Notre Dame at Quai de l’Archevêché. Unidentified bodies, mostly coming from the Seine, would be displayed publicly so they could, hopefully, be matched with a name. 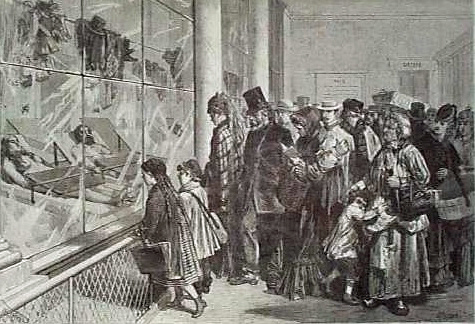 The Paris morgue was a famous institution attracting not only those looking for loved ones, but the curious. declaring the Morgue a success on that particular day. The story goes that the young woman, apparently a suicide victim as there was no sign of violence on her, was fished out of the Seine at the Quai de Louvre in the 1880’s. The body wasn’t claimed and the pathologist at the morgue thought the girl so beautiful that he had a death mask made of her face. No one discovered the identity of the woman and she remains a mystery to this day. Wouldn't you like to know her story? What caused her suicide? A broken heart? (It's the romantic in us). The mask itself became a fixture in studios of the art world, and the face of this young woman has inspired many writers to weave stories around her mysterious death and her famous smile. Thérèse Raquin (1867) can be downloaded or read free at Project Gutenberg. Fascinating. I had never heard any of that. Her face looks peaceful to me.